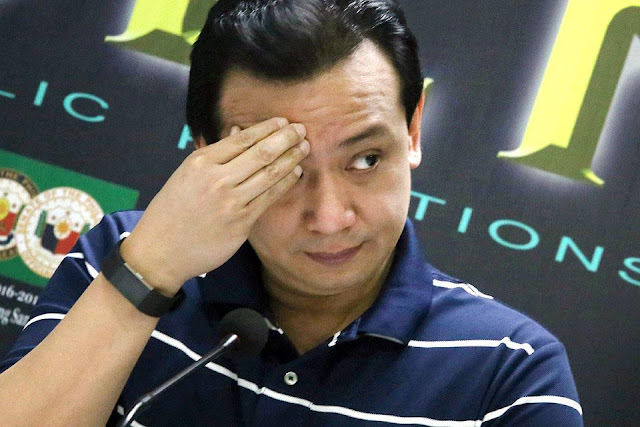 MANILA -- The Philippine National Police (PNP) said it is ready to implement the arrest of Senator Antonio Trillanes once it is ordered by the court. "The PNP as a law enforcement agency is constitutionally mandated to implement the orders of judicial authorities," PNP spokesman Senior Supt. Benigno Durana said in a statement Wednesday. "So far we haven't received any Warrant of Arrest for Sen. Trillanes," he pointed out. Durana clarified that the presence of Criminal Investigation and Detection Group (CIDG) operatives at the Senate is aimed at assisting elements from Armed Forces of the Philippines (AFP) to help ensure that actions are conducted following legal procedures. "It is also to preposition our law enforcers to ensure that, if and when WOA (warrant of arrest) is issued, it will be served in an efficient and dignified manner befitting the stature of the good Senator," Durana emphasized. Based on President Rodrigo Duterte's Proclamation No. 572, which was signed last Aug. 31, Trillanes has no pending application for amnesty granted to all active and former personnel of the Armed Forces of the Philippines and supporters who joined the July 27, 2003 Oakwood Mutiny, the February 2006 Marines stand-off and the Nov. 29, 2007 Manila Peninsula incident. This, in effect, voided the amnesty extended to him by former president Benigno S. Aquino III through Proclamation 75 issued in November 2010. On Tuesday, the Department of Justice filed a motion for alias arrest warrant and hold departure order against the opposition senator at the Makati City Regional Trial Court (RTC).